The diagram on the left is segmented into 7 sections, or columns. These columns are reflective of the 7 columns of the playing cards framework (see the Solar Book). For this study, the columns are representative of the chakras (see Chakras). This diagram is a symbolic representation of how Divine Light is stepped down through the various chakras, finally manifesting in the physical as the endocrine glands. The interaction of chemicals and hormones excreted and interpreted by the glands provides a language at the lowest level of our physiology. The color bar at the top represents the fundamental wavelength of light present in the chakra. Red represents the 1st chakra, orange the 2nd, etc. The caduceus in the center is indicated by the intertwining snakes around the winged staff. The staff in the center represents the central channel through which the kundalini rises. The wings associated with the 7th chakra represent it's transcendental nature. The grid in the center--superimposed under the caduceus--organizes the diagram into 7 sections, one for each chakra. The curved lines (one above the center and one below) connect the 1st through the 6th chakras. This encapsulates the realm of physicality. The 1st 6 chakras maintain the map of planetary influences over the associated physical and psychological presences. The 7th chakra stands alone as our transcendental connection to Divine Light, and traditionally does not have a counterpart physical manifestation. This concept will be addressed later. The point where the arches meet at the 6th chakra represents the 3rd eye. Note that the 3rd eye acts as a lens through which the Spiritual aspect of reality (7th chakra) reflects into physicality. The rows of symbols along the top and bottom reflect the zodiac of astrology as it maps over the chakras (see Chakras & Astrology). The yellow colored cells signify that the sign within rules with the forces of the day, the Sun force. The blue colored cells signify that the sign within rules with the forces of the night, the Moon force. The astrological signs are present inside the cells, showing the manner in which the zodiac is laid out over the 7-chakra grid. The planetary symbols above or below the cells represent the planetary ruler for the associated sign. Notice that the 7th chakra does not have a set of zodiac signs associated with it, but instead has large emblems of the sun and moon. Being transcendental in nature, the 7th chakra is best represented by the inner and outer light that animates form. What is implied by the symbols to the left of the the 7th chakra is that our physical self (the 6 lower chakras) is connected to the greater cosmos via the 3 outer planets of Uranus, Neptune and Pluto. These 3 planets act outside the ring of the ancient 7-planet system of old, being the the 2 lights (Sun and Moon) and the 5 visible planets (Mercury, Venus, Mars, Jupiter and Saturn). Thus, Saturn still maintains it's position as ruler of the visible world, making the 3 outer planets mediaries to a larger galactic system. These outer planets represent the connection of our higher faculties to the cosmos in general. As the signs are assigned with their associated chakra, you will notice a color-coding in effect. Take the 1st chakra signs of Capricorn and Aquarius. The background color for Aquarius is yellow, while that of Capricorn is blue, signifying that Aquarius is dominant in the day, whereas Capricorn is dominant at night. This is in reference to the original statements regarding sign placements described by Agrippa and others; Saturn rules Aquarius by day and Capricorn by night. With the discovery of the outer planets, find that Uranus is now associated with Aquarius, so that Uranus rules Aquarius by day and Saturn rules Capricorn by night. As a generality, a person who is extroverted will be more engaged with the day force, while a person who is introverted will be more engaged with the night force (see the 4 Functions). By following the color-coding as we move to the succeeding chakras, it is noticed that they alternate between being dominant by day, then night, then day, etc. This shows that the traditional placement of the signs already had this alternating sequence present in its structure. 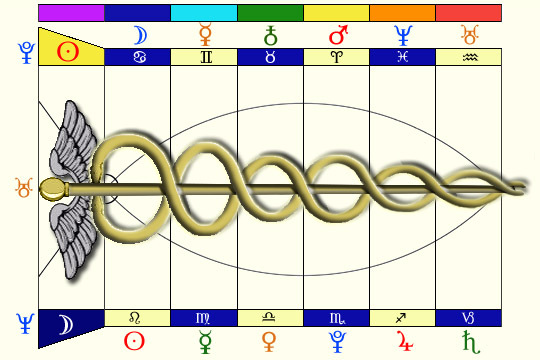 Seeing it as it is shown above, it becomes apparent that the alternating sequence creates the effect of spiraling around a central pole, and is representative of the intertwining snakes as components of the caduceus (see The Caduceus Symbol).